HARRIS COUNTY (KTRK) -- Jaden Carlton is fighting the battle of his life, but that's not stopping him from motivating others. 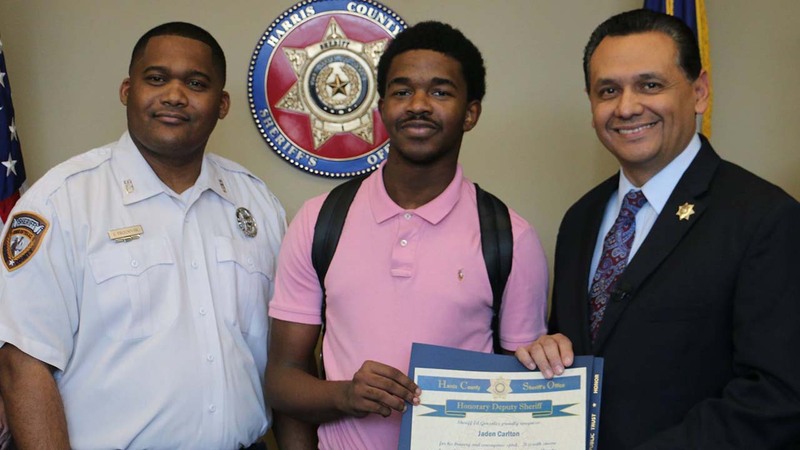 On Monday, the Harris County Sheriff's Office named the 17-year-old an honorary deputy sheriff. In June, Carlton was diagnosed with cardiomyopathy. As a result of the disease, he has suffered three major strokes in the past two months, deputies said. "The Harris County Sheriff's Office has embraced Jaden as their own and want to keep him encouraged," officials said in a Facebook post. Carlton has a pacemaker to regulate his heart and is currently on the list for a heart transplant in June. "Welcome to the HCSO family, Jaden," the post stated.